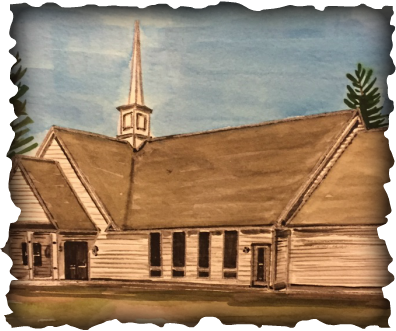 The evolution of what is now the Bar Mills Community Church began in December of 1839 when the Town of Buxton voted to allow the Methodist Society to construct a meeting house on the eastern corner of the Town Farm Road. The sanctuary was built in 1840 not much more is known except that in 1868 the building was sold to the Free Baptist Society which was organized by only nine members. In 1872 this building was moved to a lot on the Salmon Falls Road in Bar Mills. The organization bought the lot for $75.00 from a gentleman by the name of William Smith. That location was near the home of Nathan Milliken, he was a deacon of the church for 39 years. His image is memorialized in one of the stained glass windows that is preserved in our current sanctuary on Hermit Thrush Drive in Buxton. In 1913 the church became incorporated and was renamed the South Buxton Free Baptist Church. The Rev. Lewis Witham was the first minister of the church and he served as pastor for six years. Over the years the present Bar Mills Community Church has shared ministers and associations with several of the neighboring churches. Bar Mills and the Hollis Center Baptist Church were affiliated in this way from 1928 to 1943. From 1944 to 1995 Bar Mills and the Tory Hill church shared ministries which extended to a three way association with North Congregational Church in Groveville from 1959 to 1973. 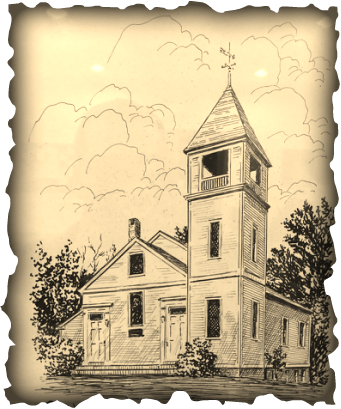 In 1995 with the separation from the Tory Hill Church First Congregational Church of Buxton , the church was renamed one more time and is now known as the Bar Mills Community Church affiliated with the American Baptist Churches of Maine. It soon became apparent that we needed larger and roomier accommodations to worship. The parking was inadequate, it was not handicap accessible, and the rooms were too small for Sunday School. The process was started to find a location for a new church building. As with any project there were bumps in the road but we never gave up hope. The new Bar Mills Community Church was built in 2006. Many features from the old building known as "The Olde White Church" were removed and integrated into the new construction. The stained glass windows dating back to 1909 were restored and placed in the sanctuary, the original bell obtained in the 1870's sits on display in front of the church and the wooden pews from 1941 are the pews we use in the sanctuary today. With having these features built into the new building, it helps us embrace our history.